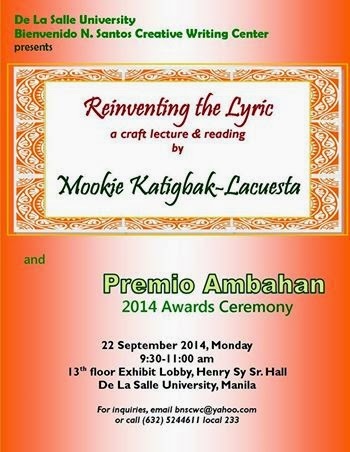 The Bienvenido N. Santos Creative Writing Center of De La Salle University (Manila) cordially invites everyone to a craft lecture and reading called "Reinventing the Lyric" by Mookie Katigbak-Lacuesta on 22 September 2014 (Monday) at 9:30-11:00 am. This coincides also with the Awarding Ceremony of Write Green: Premio Ambahan 2014. Both will be held at the 13th floor Exhibit Lobby of Henry Sy Sr. Hall, DLSU Manila. Mookie Katigbak-Lacuesta is an award-winning poet, having won first prize in the Philippines Free Press Award (2007), and the first, third and second prizes for poetry in English (2014, 2005, 2008) from the Don Carlos Palanca Memorial Awards. Her first collection The Proxy Eros (Anvil Publishing) was short-listed for the National Book Award by the Manila Critics Circle in 2008. Her second book Burning Houses: Poems (UST Publishing 2013) was launched in March 2014. She is editor of the Metro Serye series, a charming anthology of poems and stories in a road-map format. She is also DLSU BNSCWC Associate Director for Poetry. Write Green: Premio Ambahan 2014 seeks to promote the writing of ambahan as a contemporary expression deep-rooted in our tradition. A short poetic form indigenous to the Hanunuo Mangyans of Mindoro, ambahan consists of seven-syllable lines, mono-rhyme scheme, and images illustrating people’s lives in relation to their natural habitat. Its original language uses an ancient syllabary or a writing system Indic in origin. Premio Ambahan 2014 was open to DLSU undergraduate students. The theme was landscape and environment. The judges were Mookie Katigbak Lacuesta and Carlomar Arcangel Daoana.